Chocolate Week is about a number of things, but right up there at the top has to be indulgence. Well indulgence and pampering was certainly what it was all about for me when I was sent some Rachel’s Divine Desserts and a load of luxurious goodies to accompany them. The idea of a long hot soak in the bath with bubbles, candles, a Divine Dessert to eat with my very own spoon was an inspiring one. Sadly, I don’t have a bath. This was not going to stop me though. The weather may be unseasonably warm, but rest assured, those autumnal storms are already upon us. The weather has been wet and very blowy and hunkering down for the upcoming winter is looking more appealing by the day. A warm rose scented foot bath in candlelight whilst sipping a glass of prosecco did it for me. With tootsies snug in my bed socks I was finally able to indulge in a chocolate dessert. Who needs chestnuts roasting on an open fire when you’ve got all this? I loved everything about this from unpacking the box and cool bag to eating the pots. Both desserts tasted truly divine and the fact they were organic made them even more special. The bliss pack made for a delightful surprise as well as a bit of welcome luxury. The bed socks and bottle with its drink me label I found particularly cute. But pride of place has to go to the spoon engraved with my name, Choclette. Divine Chocolate Pot – a beautifully smooth creamy unctuous dessert with a strong robust chocolateyness that helped counteract the sweetness. De luxe comfort food at its best. The weather outside was frightful but the chocolate pot was delightful. Divine Vanilla Pot – this was quite different to the chocolate pot and had the consistency and flavour of a crème caramel. As someone who is very fond of this dessert, but never makes it, I was one very happy bunny. These were two very different desserts and I was happy with both. In fact I couldn’t decide which one I liked best. Ten out of ten from me and CT (yes I did share) is high praise indeed. Go on, indulge yourself, you know you want to. 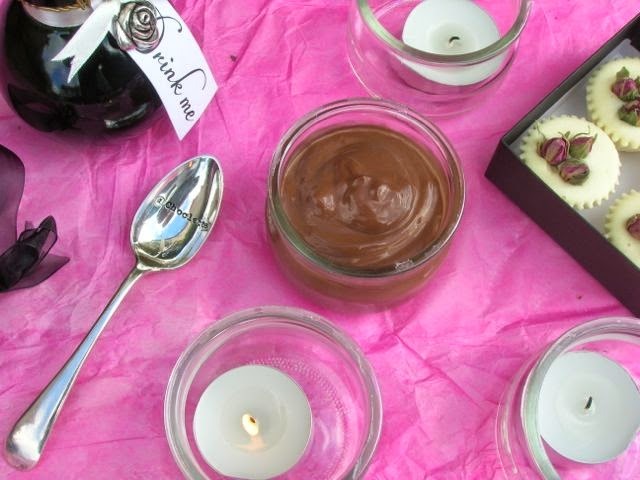 You can find Rachel’s Divine Desserts at Waitrose, Sainsbury’s and Ocado. Many thanks to Rachel’s for the desserts and accompanying goodies. I was not required to write a positive review and as always, all opinions are my own. They sound delicious, I’ve never tried the brand before but I’ll certainly be looking out for it. Well these desserts are certainly worth looking out for Jenny. I think their desserts are new kids on the block Sarah. Oh what a lovely gift to receive. I didn’t know they did choccie puds either, how very lovely. Shall be looking out for them for a special indulgence for sure! It was truly lovely Lou – all of it. Luckily I’m not really a soak in the bath person, CT misses not having one though. The chocolate pot really is very good.